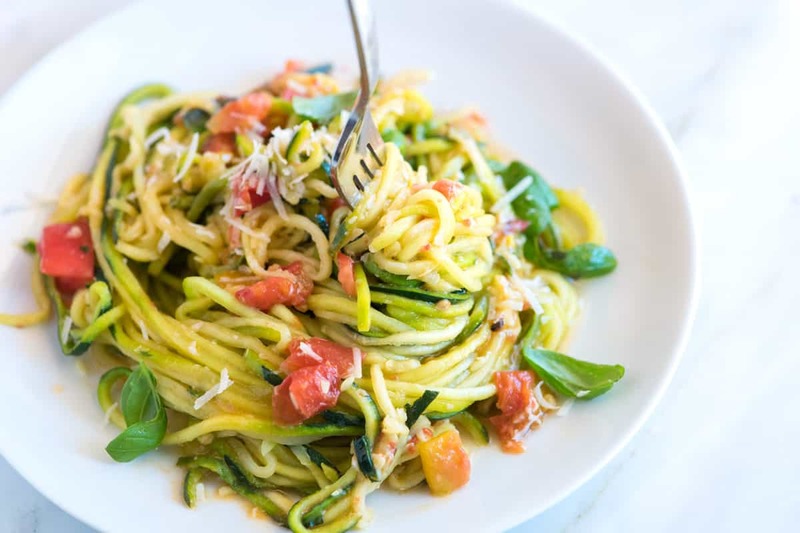 We’re in love with this easy zucchini pasta recipe. There’s fresh zucchini, tomatoes, basil, parmesan, and lots of garlic. Plus, it only takes 20 minutes to make. Make this with 100% zucchini noodles or swap half of the zucchini for regular spaghetti for a heartier meal. Add olive oil, garlic, and the red pepper flakes to a large, deep skillet. Turn to medium heat. When the oil begins to bubble around the garlic, add the zucchini noodles. Toss the noodles with pasta tongs and cook until al dente — they should be wilted, but still have a crunch; 5 to 7 minutes. Do not let the noodles cook any longer or else they will become mushy. As they cook, keep tossing so that all the zucchini noodles have a chance to hit the bottom of the skillet. Stir in the tomatoes, basil, and parmesan cheese. Cook for one minute. Use pasta tongs to transfer the noodles, tomatoes, and basil to a serving dish. Leave the liquid in the skillet. Bring the liquid left in the skillet to a simmer. Combine cornstarch and cold water in a small bowl then whisk into the simmering liquid. Cook, while whisking until the liquid thickens to a sauce; about 1 minute. Taste the sauce and season with salt. Pour the sauce over the zucchini, tomatoes, and basil. Finish with more parmesan cheese on top and serve immediately. Don’t be surprised if after the pasta has been sitting, liquid collects at the bottom of the serving dish. This is okay with us. The liquid mixes with tomato, garlic, cheese, and olive oil, so it’s delicious. Nutrition Facts: The nutrition facts provided below are estimates. We have used the USDA database to calculate approximate values. We assumed 1/2 teaspoon salt.